March 1, 2010 - Furion was awarded the 2010 Presidential Who's Who award for his professional excellence in his Therapy work. Furion works in Mercy hospital and the Brooklyn/Queens Nursing home with recovering patients. He has brought a noticeable difference in the recovery of the patients and has worked as a Delta Society Pet Partner. 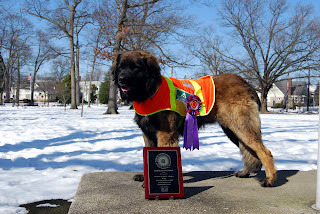 He received his DSPP title from the NYC ASPCA. Furion and his work will be registered in the Library of Congress in Washington D.C.